Let’s take a look at this Nessie thing at the beginning of the modern phenomenon. How did this Loch Ness monster mania start? Go back to May 1933. It’s a quiet week on the local paper, the Inverness Courier. But a local correspondent, who is also a water bailiff and knows the loch well, has written up a report. It still happens today. The bigger or national papers scan the local papers for entertaining little stories and repeat them, sometimes with further embellishment and reporting. Back in 1933, the monstrous hump soon became a monster. The nationals took the piece. Feeding on itself, the news reports then generated more sightings, and hoaxers helped to keep the pot boiling. Soon the first expeditions were mounted. Inverness Town Council was able to vote to reduce its tourism publicity budget for 1934. It was said at the time that an Automobile Association patrolman was able to create a loch-side traffic jam simply by pointing out to the loch. The phenomenon’s most remarkable aspect is that, as a entertaining news topic, it was sustainable for so long, and in turn the whole Nessie business sustained so much of the local tourism economy of the Great Glen. The 1960s and 70s saw a peak of investigation and sheer numbers of cameras trained on the loch. The sightings, naturally, were in inverse proportion to the numbers of watchers and the focal length of the lenses they carried. The Loch Ness Monster comes packaged with one huge advantage. Everyone would like it to be true. Small wonder it has attracted so many curious personalities to the loch over the years. But it’s much bigger business than some guy selling hand-carved wooden beasties from a caravan by the shore. From loch-side exhibitions to boat cruise companies, this is big business. Just like Santa Claus. (Pictured here) Loch Ness boat wakes cross and overlap, creating small humps. Boat wakes again, or is it the Loch Ness Monster cruising below the surface? Don't be daft! This is terribly easy. The first way is to wait around till you see overlapping boat wakes. These wakes are often created, though only by accident, by the cruise boats taking visitors out to enjoy Loch Ness and, possibly see the monster. So it’s a bit ironic yet somehow apt. As two wakes cross each other you get these odd Nessie humps, easily photographed. The second way is to photograph floating objects. Here’s a fine example of a classic ‘lake monster’. To be honest, I wasn’t even at Loch Ness when I took this picture, but you get the idea. This is a picture of the Loch Ness Monster on holiday on Loch Tay in Perthshire. Show the whole photograph of course and it’s just a tree branch - and a pretty small one at that! This ain't no Nessie. Gull on Loch Ness flying from left to right. Like this tourist picture, reproduced here, taken some years ago. The underside of the gull's wing is transformed into a writhing neck. The bird is flying from left to right and has its wings upraised. Flying gull, note dark wing forming neck shape..
Are you sure it's a gull? What do you mean, it sure looks like a neck to you? How much convincing are you going to take? Look, here's a picture I snapped of a passing gull. The light isn't striking it at quite the same angle as the 'head and neck' apparently pictured at Loch Ness, but you get the idea. I don't know why I'm apologizing, but here's another bucket of cold water over your romantic notions of loch monsters. In 1910, Sir John Murray published the Bathymetrical Survey of the Freshwater Lochs of Scotland. This was a ground-breaking survey undertaken between 1897 and 1907 when just about every major water body in Scotland was sounded and sampled. On Loch Ness, Sir John and his team took 1,700 soundings and a sediment collection from all depths. The team must have been on the loch for weeks. Does he mention a monster anywhere? Nope. Not a sign - just like the soldiers building the military road on the east side of the loch in the 18th century - and their use of gunpowder would surely have bothered a big beastie. Basically, it's only after the notion of a monster has been launched that 'believers' start hunting for supporting 'evidence' and ignoring inconvenient facts. So what else explains the 'monster' sightings at Loch Ness? Aside from these examples, everything else that’s ever been seen or photographed on Loch Ness is explained by either a swimming red deer stag, a line of cormorants, an otter, a family of otters, a small boat very far away, a badly photographed dog swimming with a stick (yes, true!) or any one of the previous seen under mirage conditions when it’s still and warm. Alternatively, it’s an object put in the water as a deliberate hoax. So, enjoy the fun. But don’t take it seriously. There are plenty of reasons for taking an excursion to Loch Ness from Inverness. But seeing a large family of animals unknown to science isn’t one of them. I’m sorry. 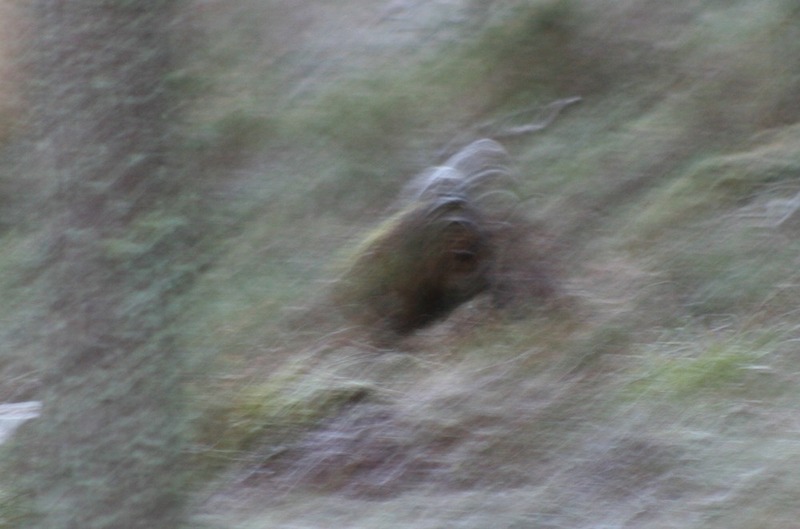 Look, would my photograph of the Scottish Bigfoot cheer you up? If so, here he is. 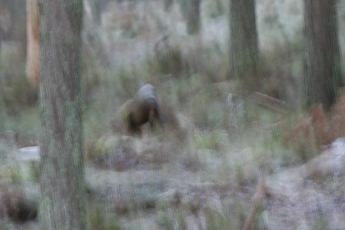 I saw him in the woods a few years back and was just able to get a shaky shot before the light went…..no, I'm not going to say exactly where, as I don't want a visitor centre and a rush of visitors. It's a nice quiet spot at the moment. If my Nessie bad attitude has damaged part of your personal belief system, I'm sorry. Perhaps you'd like to take a look at some more mysteries in haunted Scotland. Bigfoot in Scotland - 'Mucklefit'. By the way, they're spending even more money on promoting the Loch Ness Monster. Read about it on that link. Planning a Loch Ness Visit? Finally: just a thought: Is Loch Ness really worth a look? Nessie may be a Scottish icon - sometimes the only thing that visitors know about Scotland, but does our monster live in the very best bit of Scotland to visit? Or can you find even more lovely scenery elsewhere in the Highlands? Follow the link above for our take on that one. Is Loch Ness worth visiting or monstrously misleading?